It was a cold, cold weekend here in the Pacific Northwest. A mighty good reason to stay indoors and knit! This kind of frost is just gorgeous, and enticed me to get outdoors. Sooo pretty! 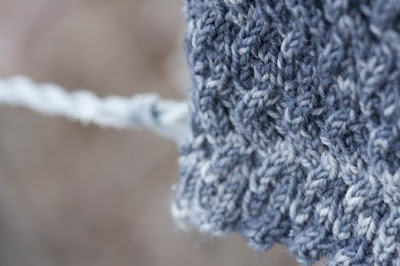 I love the soft yarn against the barbed wire. 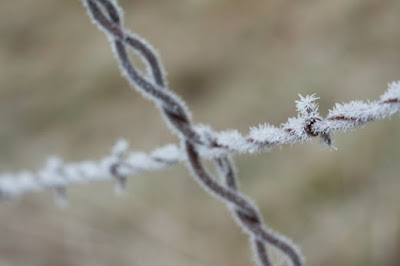 Wow that itty bitty frost is so intricate on the wire. And pretty cool that your knitting matches it. Beautiful! 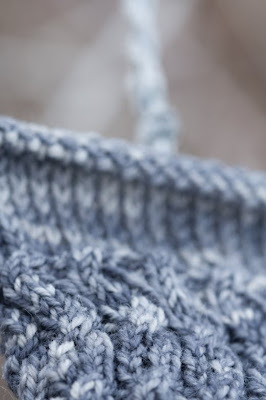 Who'd a thought to put barb wire and grey yarn together?? You of course. Sumptuous- and so is the other grey post- the one with what looks like a pool of grey uuuummmm. Was the spider still alive?? It's shocking that I haven't been here in a few days. I never want to miss a post. Pretty, pretty, pretty! I love frost. Well, to look at, anyway. You are a master illusionist! Great pairing. So so pretty, and it was quite cold I agree. those are some great shots...i love close ups! 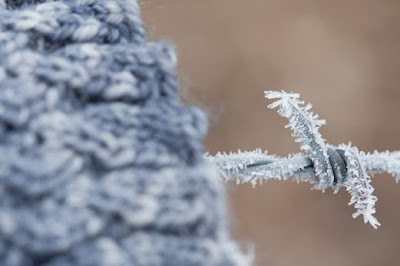 What an interesting presentation, frosted barbwire and gorgeous soft wool, the contrast between the two just causes contemplation. Gorgeous beyond words!! Your pictures of the frost almost want to make me go look at it in the cold! perfect together. I love pogonip!